The United States transportation sector is 92 percent reliant on oil, which harms our nation in many ways. This severe “dependence” on oil is not only bad for our environment, but our national security and economic prosperity as well. Mark Laken, one of the newest members of the Drive Electric Northern Colorado Electric Vehicle Enthusiast community, understands the risks well. “I believe fossil fuels have their place and it’s hard to imagine a fossil fuel-less world, but we all know the many dangers that stem from being almost completely dependent on oil in transportation. Driving electric is important because it breaks the oil monopoly and gives consumers the opportunity to choose a fuel that is from sources that are domestically abundant and price-stable, like coal, natural gas, nuclear power, wind, and solar energy. In my case, my house has a grid-tied solar array, so I can charge my car with my energy savings at night, so in a way, the sun fuels my car for free,” said Mark. Mark Laken is a civil engineer with the City of Fort Collins Engineering Department. 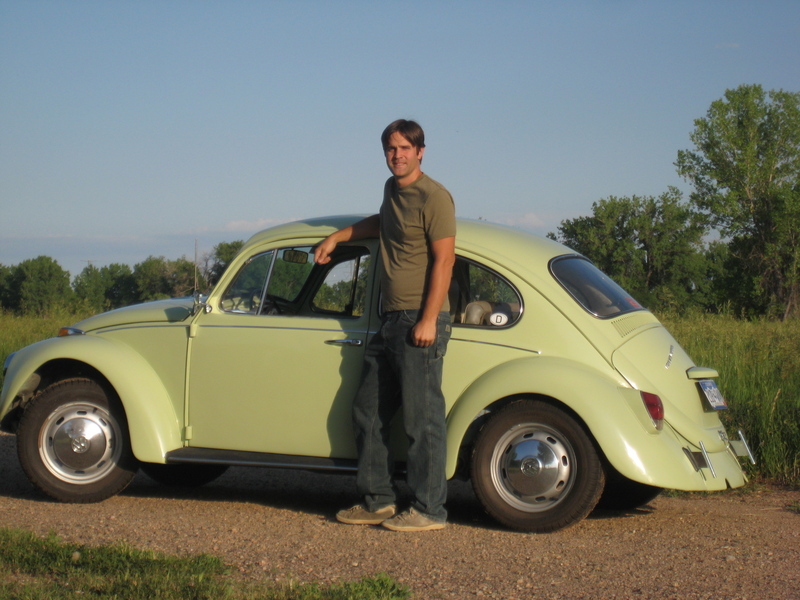 Mark has developed a passion for cars throughout the years by collecting old VWs. “I’ve always liked old cars,” he said. “Once I graduated from college, I started restoring old VW buses because they were cheap, easy to repair, and fun to drive. It’s been downhill ever since.” The most exciting piece of Mark’s electric vehicle success story is that he has completed this conversion successfully without expert experience. “I had no prior background with electric vehicles before doing the EV conversion. I hated the electricity component in high school and college physics and I consider myself a fairly incompetent electrician,” said Mark. Though he was not overly enthusiastic about the electrical component of the conversion, Mark has had a long-term devotion and passion for the cars themselves. “I would not consider myself an expert EV converter,” he said. “However, I have been fiddling with old VWs for about 18 years and know them backwards and forwards. I knew they were a popular car to convert to electric, and had wanted to do a conversion for a long time. I did a fair amount of online research and quickly learned that basic EVs are much simpler than gasoline-powered cars. It became clear that an EV conversion was easily within my range of expertise,” said Mark. Mark converted the car himself, and described the process like performing a science experiment. “I didn’t have step-by-step instructions, so I had to decipher a lot of conflicting online information about batteries, chargers, motors, transmission couplers, and speed controllers. Once I made my decisions and bought my components, the physical installation of the components was very easy,” he said. Mark loves driving his new electric Beetle because the car has more torque than a standard Beetle and higher RPM range than the original motor, so it accelerates quicker and can attain a higher speed in each gear of its manual transmission. “I can pretty much outperform a standard Beetle on my bicycle, so there wasn’t much the conversion had to achieve to outperform the original car,” Mark said jokingly. For those who are considering converting their vehicles to electric, Mark recommends talking with someone who has completed a conversion. “There is also a lot of basic information that you can easily find online. Once you have made the decision to convert a car, you can find more in-depth information at www.diyelectriccar.com internet forums. I found these forums to be very useful,” said Mark. Mark’s electric VW is attracting a lot of attention throughout Northern Colorado. “It seems like I can’t go anywhere without someone giving me a thumbs up or stopping to take a closer look,” Mark said. “VW Beetles are great conversation starters. People are always impressed when I tell them it’s an electric vehicle,” he said.